When it comes to the art of interior design, one could write books and books about the subject and still not have said all there is to say. There really is no end to all the many ways that interior design can play on the subconscious, and that is precisely the point of home staging, the main service that we offer to the people of Redmond, Kirkland, and other surrounding areas. Home staging is essentially the process of rearranging a home so that it will appeal to prospective buyers and show of the home’s true potential. As such, it’s important to follow tried-and-true rules of interior design, and although these vary greatly depending on the home, the furniture at hand, and the size of the rooms, there is one consistent principle that should pretty much always be followed — you want rooms to feel as big as possible. When people are buying homes, they want the most bang for their buck. If they feel like every room is small and cramped, it’s only natural that they’d seek an alternative that feels more spacious and open. That’s why it’s important to employ special tricks which create this illusion, even if the room itself doesn’t have very much square-footage. 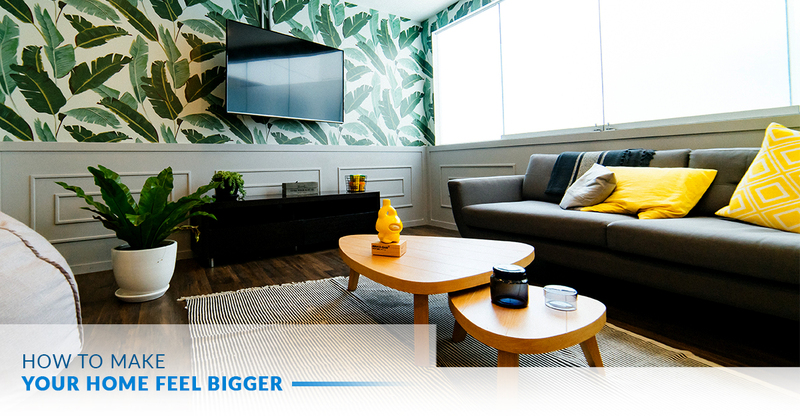 Here are some tricks to making the rooms in your home feel bigger! There’s nothing that feels more claustrophobic than a ceiling that’s seemingly closing down on you. People don’t want to feel like they’re caught in the crushing ceiling trap in Indiana Jones and the Temple of Doom, and that’s why home stagers often employ tricks to draw the eye upwards toward the ceiling — this makes the room feel taller than it actually is, and therefore more spacious. Simple Wallpaper On the Ceiling: If you paint or cover the ceiling with an innocuous pattern, it can be a good way to draw the eye up. Careful now, you don’t want to be too bombastic, otherwise, the ceiling could just end up being distracting, thus ruining the effect. But something light and simple can go a long way! Shelves Near the Ceiling: In many home staging jobs, we’ll put shelves near the ceiling if they’re available, and line them with books. By making the contents of the shelf so high up (and more or less inaccessible unless you’re tall) it creates an illusion of height. Floor to Ceiling Decorations: Finally, if you have decorations or furniture which reach from floor to ceiling, this is also a good opportunity to draw the eye upwards. Curtains are a good solution, as well as bookshelves. Colors have a profound impact on the look and feel of a room. As a general rule, darker rooms feel smaller, and brighter rooms feel bigger. When in doubt, it’s hard to go wrong with good old-fashioned white. If you ever have home stagers insisting that your home gets a new paint job, they’re not just trying to be excessive or inflate the price of the job — new paint can be the difference between feeling spacious or cramped. As we already mentioned, white is a very safe choice, but you can also go with light pastel blues and yellows. The final choice will depend on how well it jives with your floor and furniture, but if there’s one thing you should absolutely say yes to in a home staging job, it’s the interior paint job. The difference that it makes simply cannot be understated! One thing that can make a space feel cramped is if it’s stuffed full of little things. You want to feel like the room exists to serve you, instead of feeling like you’re sharing the space with countless other permanent residents. The first thing that home staging companies often do is finding a way to condense all the clutter into unseen areas so that the room feels more down-to-earth and spacious. There are a few clever ways to do this. The Cantaloupe Rule: Many interior design experts claim that objects smaller than a cantaloupe have a crowding presence in a room. They recommend the “cantaloupe rule,” where you don’t have any decorative accents that are smaller than an average cantaloupe. If you’ve got little toys, gadgets, and gizmos lying about, it’s time to pack them up! Hidden Storage: Many coffee tables, ottomans, couches, and more have compartments inside which allow you to inconspicuously store things. These are a lifesaver, because they eliminate the need for having separate boxes or crates for storage, while still functioning as a useful piece of furniture. High-Rise Bedding: Space is wasted by blocky furniture, and beds are the guiltiest party. What difference does it make whether you’re sleeping one foot from the floor or five? Not much. However, it makes all the difference if you’re considering storage. An elevated bed can fit tasteful storage underneath, allowing you to “double dip” in the space it’s taking up. Two birds, one stone. This is in line with the same principles that we mentioned above in regards to the color scheme. Dark spaces feel cramped, and light spaces feel open. While paint is one way to achieve this, light can work just as well. Put the two together, and you’ve really got something cookin’. Natural light is the best choice if it’s available. If you’ve gotten into the habit of covering up your windows with blinds or curtains, home stagers will probably tell you to change your ways and let that glorious light in. Sunlight is a boon to interior design, especially if you want to evoke spaciousness. Of course, artificial light is always an option if you don’t have natural light at your disposal — it’s not really practical, after all, to carve a new window into the wall just for home staging purposes. A dark room should be brightly illuminated by tasteful lamps. As useful as it is to learn about interior design, there is one easy way to make sure your home will look beautiful to potential buyers, without any effort on your part — hiring a home staging company! At IntExt staging, we offer home staging services to homeowners in Redmond, Kirkland, Snohomish, Issaquah, and other surrounding regions. If you’re in or around the greater Seattle area, we’d be happy to lend you our services. We know all the little tips and tricks that will make your home look appealing to buyers, and we’re ready to put them to good use. Are you looking to get a higher dollar value for your home? Do you want to sell as quickly as possible? Home staging is the ideal way to make these things happen. Contact IntExt Staging today!